I bought some packed almonds and soaked them in water for about 24 hours. I then removed the water with a sieve, cleaned the bowl and put the almonds back. I covered the bowl with a paper towel and left them for about 48 hours. 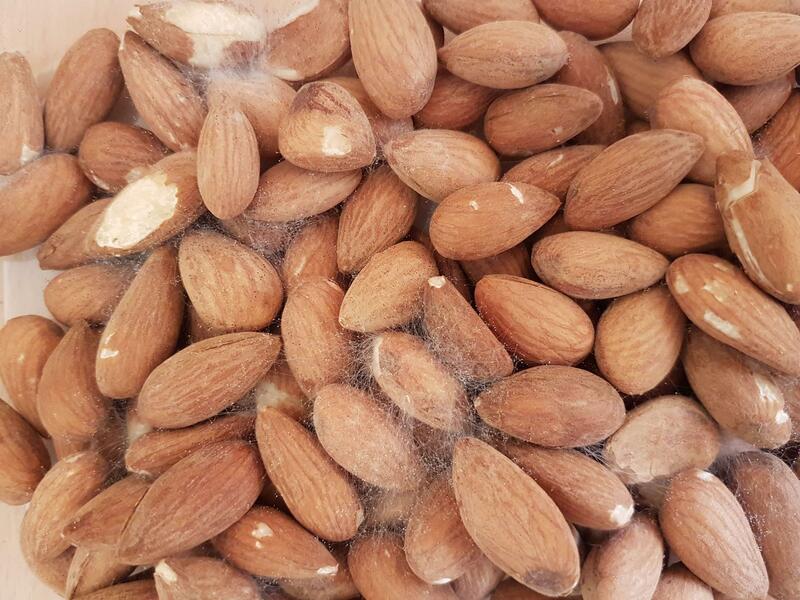 I then placed them in a plastic container and when I opened it the next day, the almonds were covered with a web-like substance. Were the almonds infected by fungus? How could this have happened? They are covered by mold, a type of fungus. What has happened is, mold loves moisture and when you closed the lid on almonds which had a good amount of moisture in them, the mold had the right conditions to grow. Note: You should discard them all. If you were trying to create almond flour or something, after washing them you should peel off the skin and dry them fast. Under a fan or in a lukewarm oven (200 f) If you allow moisture to stay on it for long time fungus forms as happened now. Not the answer you're looking for? Browse other questions tagged food-safety almonds or ask your own question.